Jerry Bennett, an Oklahoma comic book artist, is drawing for Marvel Comics, Lucasfilm and Power Rangers. He’s an artist living a dream–working full-time doing what he loves. I met Jerry and his wife several years ago as fellow members of the Society of Children’s Book Writers and Illustrators (SCBWI). I enjoyed visiting him in his how studio to learn more about how he draws lines that create action and emotion. 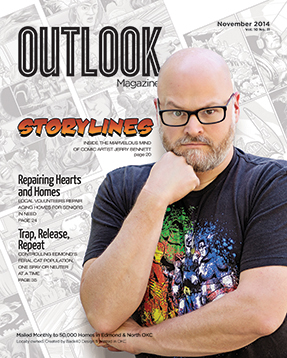 “Storylines” is the cover story for Outlook Magazine, November 2014, by Amy Dee Stephens. Comic books and superheroes-they aren’t just for kids! Adults love them, and Hollywood has introduced them to a whole new generation. 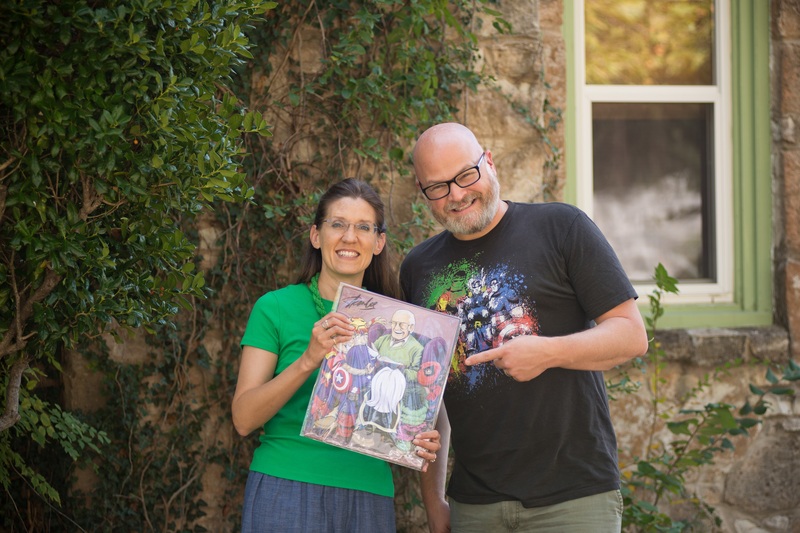 Meet Jerry Bennett, an Oklahoman who is making a full-time living as a comic book artist. His designs have been licensed by the biggest companies in the industry, including Marvel Comics, Lucasfilm and Power Rangers. No surprise—Bennett’s small home studio is an explosion of color. Movie posters, superhero drawings and inspiration pieces cover the walls. Boxes of his art prints line the floor, and action figures set on a shelf along with a very real-looking light saber. But Bennett isn’t outflanked by the kaleidoscope of supernatural memorabilia—no, it’s his joyful personality and booming laugh that captivate one’s attention. He has good reason to be joyful. He’s living an artist’s dream, rubbing elbows with some of the biggest names in the business, and gaining a following of fans—including Stan Lee, the creator of Spiderman, Iron Man and X-Men. Lee recently saw one of Bennett’s Spider-Man drawings at the Salt Lake City Comic Conference (known as Comic Con). He invited Bennett to create an exclusive print for the Stan Lee Foundation for literacy. Bennett calls it one of his greatest honors. Bennett’s career didn’t start with a BAM! Amy with Jerry Bennett, featuring his Stan Lee poster. Photo by Marshall Hawkins. Then finally, POW! Bennett’s big break came six years ago when he drew a movie fan design which parodied Ghostbusters and Star Wars. A friend suggested that it would make a great t-shirt design—and 3,000 sold in 24 hours. Shortly afterward, as Bennett was about to turn 40, he decided he didn’t want to work his regular job anymore. “So, I quit and took a leap of faith.” It was a leap without a cape or superpowers. Bennett created a portfolio and purchased table space at a Comic Con in order to gain exposure for his art. He entered contests. He took on small projects. Now, Bennett’s award-winning artwork is popping up all over, from a licensed Power Rangers t-shirt and Oklahoma City Thunder basketball team image, to the annual report cover for the Oklahoma Pioneer Library System. Currently, Bennett is serving as a fill-in artist for Larry Latham, author and illustrator of a popular online comic called “Lovecraft is Missing.” In former years, Latham produced cartoon television shows such as Disney’s Talespin and Hanna-Barbera’s Smurfs. After a recent cancer diagnosis, Latham hired Bennett to carry on his comic book series during his recovery. Bennett just wrapped up an art show at a gallery in the Paseo district. He is also working on two educational projects. The first is a non-fiction graphic novel called “Felix Faces His Fears.” It’s the true story of Felix Bumgartner, who skydived from outer space in 2012. Bennett is also designing college course booklets for a business professor at the University of Oklahoma who believes that students are more likely to read assignments written like a comic book. As glamorous as it sounds, the outgoing Mr. Bennett spends much of his working life in solitude. He listens to music or audio books while he draws, and he walks his dog each day. He uses this time to take a break from his contracted work to think about the personal projects he’s trying to pursue—an original graphic novel, an illustrated children’s book, a comic book version of a spiritual hymn. Several years ago, Bennett tucked away his drawing easel and art pens—replacing them with a high tech computer graphics program. A digital pen allows him to “draw” on a special monitor, like he used to do on paper. When Bennett first gets a script, he visualizes each panel like a movie shot, making sure that each scene has action. He then allots space for written text bubbles and adds scenery details that keep readers grounded in the setting. After several digital pencil sketches, he draws the final lines and fills in details. “Art brings stories to life and gives them heart, soul and expression,” Bennett said. “I’m dying to tell emotional stories that make people laugh and cry,” Bennett said. That emotion is exactly why Hollywood has latched onto comics, Bennett believes. And it’s working, if the rising number of fans at Comic Cons across the country is any indication. Bennett enjoys socializing at the Comic Cons and meeting celebrity actors. More importantly, it has been his door into the publishing industry, and he has several big prospective projects on the horizon. He’s hopeful that in the future he’ll establish his own graphic novel series—one that might land on the big screen someday. Bennett may not be leaping tall buildings in a single bound, but that crucial leap of faith to pursue art full time has quickly escalated his career to enviable heights. “It seems like so many people give up on their aspirations—I’m blessed and fortunate to be one of the few living my dream.” WOW! If you enjoyed this, check out another story I did about a year ago that mentions Jerry’s artwork and how he is inspired by animals.